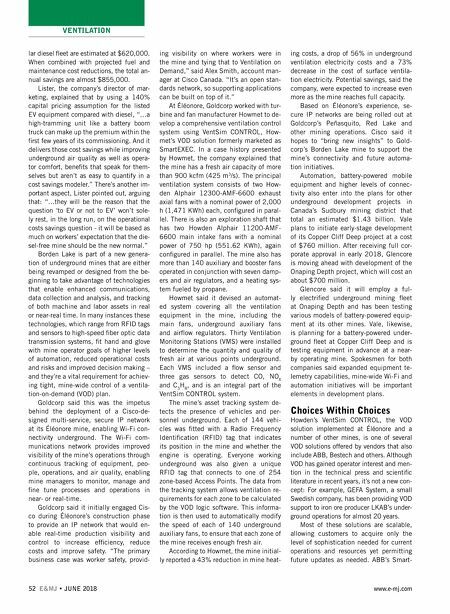 VENTILATION JUNE 2018 • E&MJ 53 www.e-mj.com Ventilation package, for example, can be configured in three implementation levels: • SmartBasic – Centralized supervision and control of ventilation equipment from ABB System 800xA Operator workplaces. • SmartMid – A full-scale VOD solution with automatic control of the ventilation equipment according to actual demand. Ventilation demands are dynamically calculated from mine production sched- ules and events and event equipment status and location. • SmartPerfect – Mine Ventilation Opti- mization using ABB's SmartAir Opti- mizer module. ABB said SmartAir, a model-based approach, uses sensor feedbacks and advanced multivariable control technology to perform mine-wide control and optimization of air flows and air quality while minimizing energy con- sumption in real-time. Bestech's NRG1-ECO suite, billed as an "energy consumption optimization" solu- tion, is a VOD package that also provides multiple levels of control typically found in high-end VOD systems. These include: • Manual Real-Time — allows user mani- pulation of devices through a web interface. • Time of Day Scheduling — automatically adjusts devices at specific times of the day such as the start or end of a shift. • Event Based — devices will be stopped, started or adjusted based on an opera- tional or programmed event. • Environmental — responds to environ- mental sensor networks inside the mine to maintain air quality within regulated parameters. • Tagging (Activity Based) — integrates with new or existing Real-Time Location Systems (RTLS) to deliver the required air flow based on personnel or vehicle locations in the mine. The system provides environmental monitoring by logging digital or analog sen- sor information such as particulate, SO 2 , CO, NO X , barometric atmospheric pressure, temperature, humidity and air flow, and in- tegrates with new or existing systems from Allen-Bradley, Schneider Electric, Siemens, Cisco, AeroScout, Becker, Varis, Smart Tag, PI and ION, according to the company. In an article written for Canada's Inge- nium website, Marc Boudreau, president and co-CEO of Bestech, noted that the company, after implementing NRG1-ECO across five levels of the Coleman mine in Sudbury, saw electricity consumption cut by 4.4 MW-h, which adds up to $375,000 in savings per year. And by easing the burden on the power grid, greenhouse gas emissions were reduced by an estimated 780 mt. "If these results were replicat- ed across an entire mine, our technology could help operators save as much as $3 million annually," said Boudreau. When Vale opened its Totten copper/ nickel underground mine in Sudbury, Ontario in 2014, the mine's ventilation was administered manually with all fans, louver and doors controlled by an ABB 800xA DCS from a room on the surface. Ventilation Monitoring Stations (VMS) were installed throughout the mine to report on air velocities, relative humidity, dry bulb temperature and CO level. Using this manual approach, Totten chalked up an estimated 25% savings in annual en- ergy consumption from fans and natural gas heaters. After implementing a tag and track- ing-based mode of ventilation control on one mine level in 2016 and subsequently expanding to additional levels throughout the mine, energy savings ballooned to be- tween 50%-60% compared with baseline energy consumption levels before the up- grade,** which involved introduction of Bestech's NRG1-ECO control system pro- gram coupled with the 800xA DCS. The mine-wide implementation of the higher level of control was a 15-month project that ended in late 2017. VOD, Meet IoT The ultimate success of mine-wide VOD at Totten, Éléonore and others depends heavily on the convergence and adapt- ability of reliable, affordable "connect- ed" Internet of Things (IoT) devices and datacomms systems with evolving mining techniques and underground conditions. Without reliable sensors, robust cabling and efficient wired/wireless interfaces, the demands of real-time VOD would be hard to achieve. Luckily, technology is advancing rapidly. 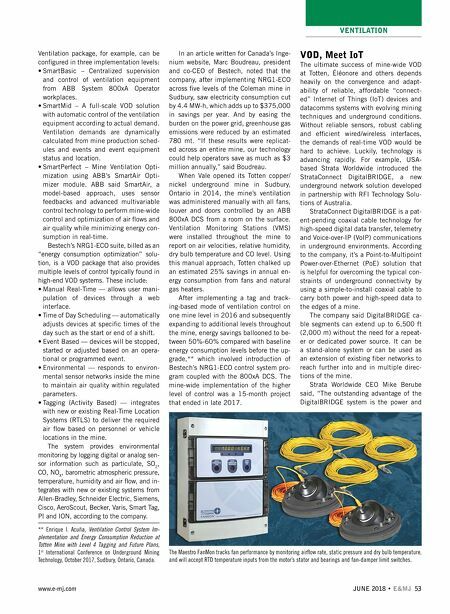 For example, USA- based Strata Worldwide introduced the StrataConnect DigitalBRIDGE, a new underground network solution developed in partnership with RFI Technology Solu- tions of Australia. StrataConnect DigitalBRIDGE is a pat- ent-pending coaxial cable technology for high-speed digital data transfer, telemetry and Voice-over-IP (VoIP) communications in underground environments. According to the company, it's a Point-to-Multipoint Power-over-Ethernet (PoE) solution that is helpful for overcoming the typical con- straints of underground connectivity by using a simple-to-install coaxial cable to carry both power and high-speed data to the edges of a mine. The company said DigitalBRIDGE ca- ble segments can extend up to 6,500 ft (2,000 m) without the need for a repeat- er or dedicated power source. It can be a stand-alone system or can be used as an extension of existing fiber networks to reach further into and in multiple direc- tions of the mine. Strata Worldwide CEO Mike Berube said, "The outstanding advantage of the DigitalBRIDGE system is the power and ** Enrique I. Acuña, Ventilation Control System Im- plementation and Energy Consumption Reduction at Totten Mine with Level 4 Tagging and Future Plans, 1 st International Conference on Underground Mining Technology, October 2017, Sudbury, Ontario, Canada. The Maestro FanMon tracks fan performance by monitoring airflow rate, static pressure and dry bulb temperature, and will accept RTD temperature inputs from the motor's stator and bearings and fan-damper limit switches.